The legendary Penfolds, St. Hallett, Wynn’s Coonawarra Estate or d'Arenberg might be familiar to you, or perhaps regions such as the Barossa, Clare Valley, Murray River or McLaren Vale prompt recognition upon reading. 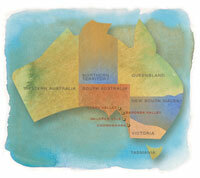 These are just some of the names associated with this great Australian State, where Adelaide is the capital city. Now that the volume game has been won, what's emerging are the extraordinary levels of quality from the best Australian wineries, and while the great wines come from both big players and minnows, it is often the minnows that excite. If you've drifted away from Australia of late, it's a good time to re-engage; we've cornered the outpourings from some magical maestros for your benefit to give us a timely reappraisal of the Lucky Country's most delicious libations.